This May, enjoy spring on your own terms. For more than 30 years, the greatest horticulturists, nurserymen and gardeners have been meeting annually for this exceptional Flower Show. For the third year in a row, Chantilly is hosting this special event in the famous Chantilly Domain, and mainly in the castle grounds (“Parc du Château”), a genuine French green setting, a genuine French oasis. 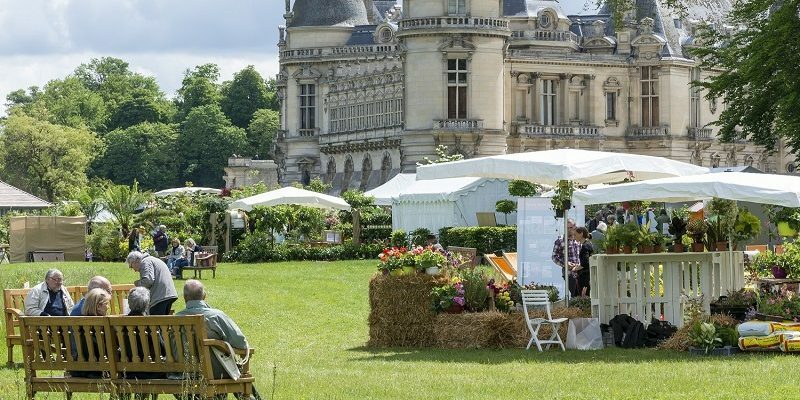 Meet professionals and fans, and share your passion for cultivating your garden from the 17th to the 19th of May 2019 at the Chantilly Flower Festival. The second edition will be from the 18th to 20th of october 2019. This year, the theme for the Chantilly Flower Show is inspiring and promises to be a true treat for the senses. Here, you’ll get much more than a green thumb. This is the place to be in the world of gardening to discover the richly colourful landscape of Chantilly, in the middle of the most exuberant European plants and flowers. Live your passion for flowers and plants of all colours for these three days in May 2019 at Chantilly. Horticulture, floriculture, landscaping… For this spring edition, come share all your experiences with professional experts and fellow fans in the Chantilly Domain. More than 250 exhibitors, conferences and workshops for children will be on hand. All the elements are here to make your day colorful and marvelous for you and your family or friends. This place is essential and ideal for anyone who wishes to truly appreciate mother nature in its greatest form. Cultivating your garden is a must! Don’t be afraid to get your hands dirty. Discover this world full of green life. Plant and flower nurserymen and landscape gardeners, discover all the ways that you can cultivate your garden. You’ll be enchanted by a full range of collector, classical and extravagant plants. Find many handicraft and garden furnishings dedicated to the passion of gardening.